The legless lizard, our newly joined animal ambassador, just made her debut and got her name – SLITHER! It was nominated and voted by all guests of Animal Encounter at JG Club last weekend. It was closed. SQ(u)EEKY lost by only 1 vote. We might use this name for another of our animal star. Slither is a female European legless lizard, aka Sheltopusik (means yellow belly in Russian). This is a true freak, seems to be developed with full of contradictions. Being a lizard and it chose to lose its limbs and reduce its mobility. It prefers dry habitats but would often have to go to wet habitats to find its favorite food – earthworms, snails and slugs. It is the largest species of all legless lizards, reaching over 4 feet and being the king of its own clan, but it would drop off its own tail when threatened like a tiny gecko. You might think that a lizard with no legs is like a snake. But when you look closely you will find her very different from a snake in many ways. The eyes, the ears, the tail, the scales, the tongue, the behaviors, nothing alike. If snakes derived from lizards, then the legless lizards must have been like an abandoned experiment. 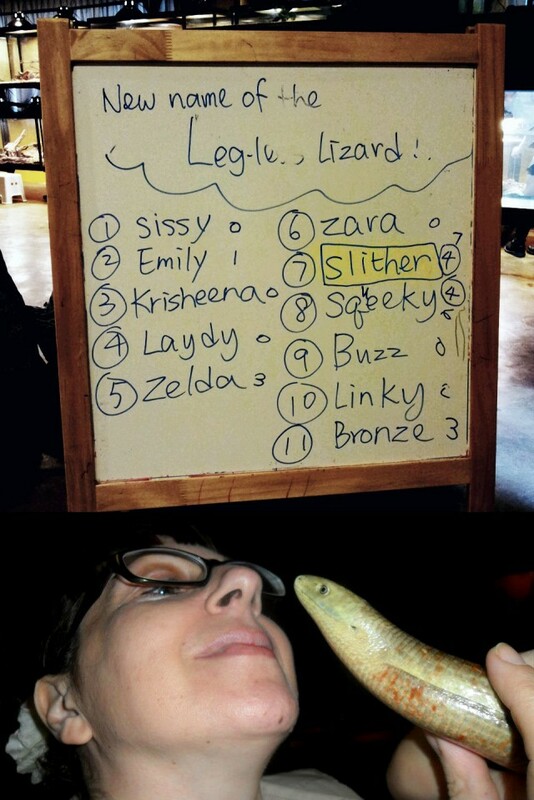 Slither has started her ambassadorship. Check her out at our events and experience the extreme side of nature.